…so long as we share the light. Catherine Chandler (Linda Hamilton) is a Radcliffe grad, a young and beautiful corporate lawyer; a woman who seems to have it all–except a true motivation and reason for living, rather than just existing in her (relatively privileged) world. That all changes on one fateful night when, mistaken for someone else, she is horribly beaten, scarred, and left for dead. 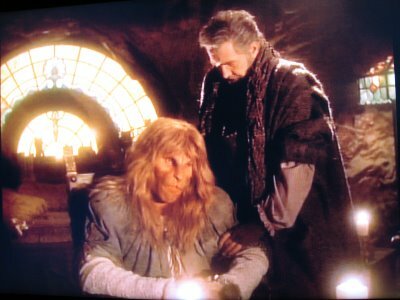 She’s found by Vincent (Ron Perlman), who also hides his “scarred” face (but never his compassionate heart), and taken underground. Unknowingly, Catherine has just entered a world apart from hers, a world unknown to her… Once Upon a Time, in the City of New York. –Vincent, introducing Catherine to the world she never knew. Catherine discovers a society of people who have, whether through necessity or choice, walked away from “the world above” and created their own existence below the city of New York. A community based on peace and understanding, greater than any individual, who never turn their backs on anyone… especially an unusual child left on the steps of St. Vincent’s hospital years ago. The child was brought to Dr. Jacob Wells, one of the founders of this group. Jacob is popularly known as “Father” (Roy Dotrice), both for his role in creating this new and just society, and for essentially being the “father” of the young foundling, who has grown up to become Vincent. For you see, Vincent, while he has the greatest heart and soul of any human, looks more like a lion, with fur, claws, teeth…. and nobility. And it is he, at the risk of discovery by the world “above”, who brought Catherine here to be healed by Father. It was Vincent who brought to her light… and life, again. Catherine’s injuries included, for a time, her eyesight, and so she only knew Vincent (at first) through his voice, his tenderness, and his compassion… and fell in love with him, and he with her as well. And although she recoiled at her first sight of him, her heart overcame her surprise, gladly, overwhelmingly, and soon a love of the ages was born. Theirs is an inspired love, a connection, stronger than fate, emotion, or passion. It is the kind of love destined to last longer than time itself, and greater than words are ever needed to express. Thanks to that love, and the discovery of an entirely different life, Catherine returns to “her” world with a new mission, to become a “Helper”, both to the underground group, and to the downtrodden others with nowhere to turn in the world above. The former corporate lawyer takes a job as an overworked assistant for the D.A.’s office, with her new boss Joe Maxwell (Jay Acovone) and a new-found purpose to help others. And thanks to the “connection” she still shares, Vincent can sense when she is in trouble and come running to help when needed. Now, if this was an ordinary TV series, that would be the extent of the premise. But Beauty and the Beast was no ordinary show, not by any stretch of the imagination. If CBS had their way, the show would have simply been a formulaic “damsel in distress” show, with Catherine investigating the week’s crime, ending up in danger, and Vincent rushing in to save the day (and then off again, unseen, as her mysterious “savior”). The focus would have been on the world “above”. But that’s not quite how it happened. The fans (and there are a lot of VERY loyal fans) responded, not to the “fears” of the world above, but to everything else the show had to offer in the world “below”…. –The candle-lighting opening of Winterfest, a tunnel community celebration. 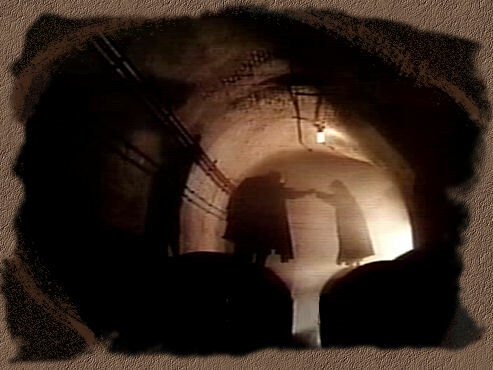 Those who “shared the light” included people like Jamie, Mouse, Winslow, Kipper, Pascal, Mary, and the others who lived “below”, and to their “Helpers”, the people topside who kept their secret, like Catherine. The show created a wondrous world beneath the mean streets of New York, a new world where people seemed to have become better than most of our “usual” society; where communication meant quotations of Shakespeare, and dreams were based on virtue instead of avarice. 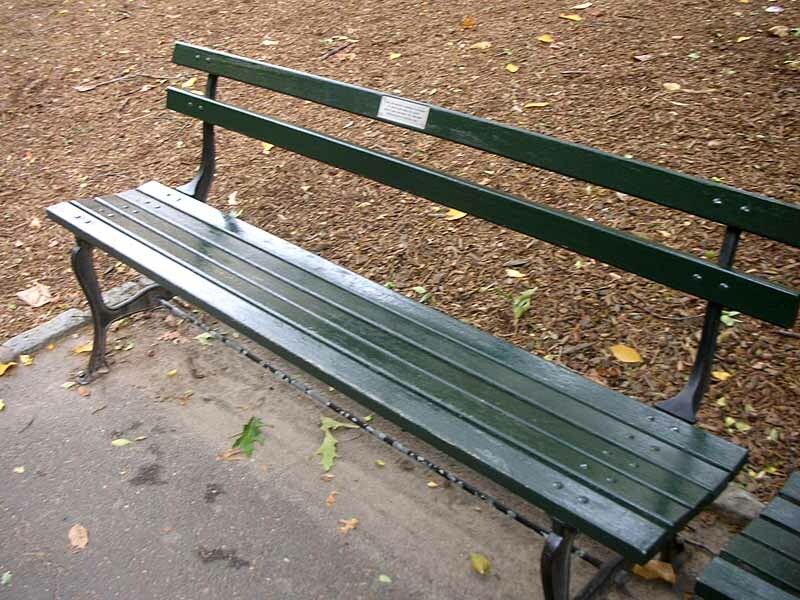 Most of all, it was a world that could create the amazing connection between Vincent and Catherine, where even dreams pale in comparison to their relationship…. “…for we have a bond stronger than friendship or love… and although we cannot be together, we will never, ever, be apart…. –Catherine, in the opening credits. Not only was there a bond between Vincent and Catherine, but there became a bond amongst the fans of the show. After premiering in 1987, it quickly spawned a fandom similar to that of Star Trek and some other “niche” shows, even more so in dedication, if not in size. The televised “tunnel” community, as Utopian as it was, became a model for the “fan” community. And that, truly, is the lasting legacy of the show, and the uniqueness of its fans. Lifelong friendships have been made because of this show. Lives have changed because of this show. And if you think this is hyperbole, then I invite you to visit the Yahoo Groups site of Beauty and the Beast fans, still going strong (and I mean STRONG) almost a quarter of a century later. There have been yearly, in-person conventions, the most recent being just this past month in San Diego. This year’s convention also included a surprise visit from the Beauty herself, Linda Hamilton, whose appearance was webcast and just put online, and next year’s live gathering will be held in New Orleans (More info on live gatherings can be found here). But, in keeping with the “underground” nature of the tunnel society, the fans have adopted their own yearly Winterfest, a virtual celebration unique to the show. Online, you can find fan fiction, artwork, poetry, games, articles, opinion, and lots and lots of general love and joy for all those other souls who wish to share, as Vincent once put it, “their better selves”. Each year, a weeklong online celebration is held, with all this and more…. And, as Winterfest on the series always started with a candle-lighting ceremony, symbolically pushing back the darkness of the ordinary world, so too do all these people connect with each other, virtually and in reality, to bring light into each other’s lives. Of all the shows and fans I’ve talked about in this column, Beauty and the Beast fans continue to be, as a whole, the most passionate, the most involved, and the most positive people I’ve ever met. They’ve truly created their own community, all based on a wonderful hidden world, the positive themes of the show, and the characters they love. RON PERLMAN (Vincent) was a “faceless” actor for most of his early career, playing behind the Beast makeup as Vincent, but also doing numerous voice-over roles in commercials and animation. He finally was seen, himself, regularly in the TV version of The Magnificent Seven, then followed with more voice-over work until his movie (and mask) work in the Hellboy series. He is currently seen, sans masks, as one of the leads in the critically acclaimed series Sons of Anarchy. ROY DOTRICE (Father) dates his television career back to 1957, and until Beauty and the Beast was usually cast as the heavy in guest roles on series like Tales of the Gold Monkey, Remington Steele, and The A-Team. He was a regular on Mr. and Mrs. Smith and Madigan Men, and played the “ultimate” father role of Zeus on Hercules. Most of his work in recent years has been in England, in addition to a cameo with Ron Perlman in the movie Hellboy II. JAY ACOVONE (Joe Maxwell) kept being “that guy who keeps showing up” in various series, not quite a regular, but playing the same character multiple times. He’s been in multiple episodes of Murder, She Wrote, Renegade, Silk Stalkings, Providence, and Stargate SG-1, including the final movie episode of that show. He’s also been on a number of episodes of General Hospital. There’s a complete series DVD set (as well as individual season sets), but they’re remarkably devoid of extras. A “soundtrack” album, titled Of Love and Hope, was also released, and it not only includes some of the gorgeous music from the show, but also Perlman, in character as Vincent, reciting Shakespeare sonnets and other famous literature, much of it featured on the show itself. And here’s the opening of the show on YouTube, where you’ll also find many other fan-created videos using scenes of the show, especially numerous love themes, for obvious reasons. “SND” fans (and you know who you are), please read no further. I have to be complete, and at least mention, briefly, what else exists, and what “SND” means. For those who wish to continue, please do so after the Vital Stats section, where I will add more to the story of the show. For those who wish to remember the show as it should be, thank you, for your love, and for your light. –Tim R.
44 episodes of the first two seasons — 12 more episodes (explained below) — no unaired episodes. Aired at Friday 8/7 Central: Most definitely yes, and one of the best shows ever to do so. Comments and suggestions appreciated, as always…. Now then…. I’m going to break a couple of rules here with this blog: First, and most obviously, I just wrote about a two season show that ran 44+ episodes, a bit longer than most. This show was so good, so important, and so personal for me to write about, that I felt I needed to. Besides, I “connected” with the true love of my own life (whose name also happens to be Catherine) while this show aired, and I’d be more than remiss if I didn’t dedicate the best of this article above to her. However…. here’s the second broken rule: I didn’t talk about the whole show. Deliberately. Just to be complete, I have to mention the third season. Beauty and the Beast was essentially “canceled” after its second year, rabid fan base and all… except that CBS ordered 12 more episodes to be aired at mid-season, ultimately on Wednesday nights. 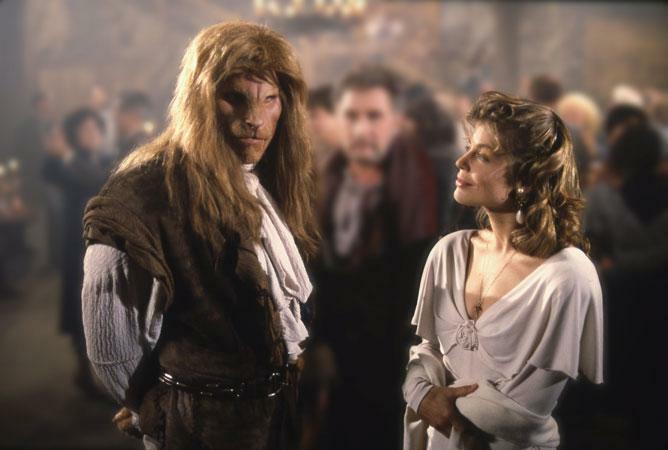 The problem with this was, Linda Hamilton’s contract specifically said that if the show got any less than a full season order (or a fall season order, there’s some conflict about that…), then her participation was not guaranteed… and it’s kind of hard to have a show called Beauty and the Beast without the Beauty. Linda agreed to approximately 10 days of shooting, to resolve the cliffhanger ending of the second season, and her scenes were interspersed throughout the 12 episode third season… aired out-of-order, no less, thank you CBS. And the writers, in their infinite wisdom, introduced another female lead (Jo Anderson) to “search” for the now missing Catherine, and, in the ultimate insult to the fans, KILLED OFF the Beauty of Beauty and the Beast. On television, at least, Catherine was dead. Outrage is too mild a word. Hell, Revolution is too mild a word. Suffice to say, most fans completely IGNORE the third season, and any and all events therein, to the point where the acronym “SND” was developed online, meaning “She’s Not Dead” (referring to Catherine, of course). Therefore, Vincent, Catherine, and the tunnel world still exist, if only in the hearts, minds, and joy (not to mention the fan fiction) of those who have been touched by the show. You can’t (and SHOULDN’T) even mention 3rd season on the newsgroups, at least without significant fair warning, such is the negative reaction of many to the portrayal of those events, even now. The love between Vincent and Catherine may have had a winter, but it will never end. No matter what happened in the “television” world, there’s far too many in “our” world who will never let it happen. Their light will always be shared… and the story continues….